New In Town? 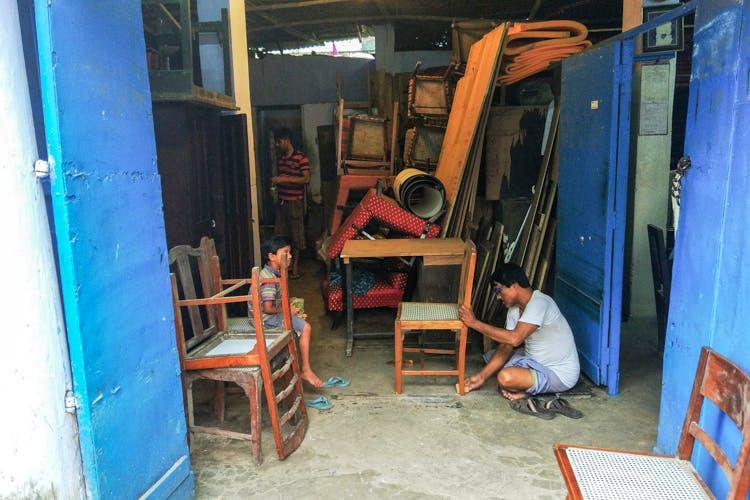 Rent Furniture From This Market In Kolkata For As Low As INR 30! If you’re a newbie in the city or looking to spruce up your room, the amazingly retro furniture at these shops along Rafi Ahmed Kidwai Road is exactly what you need. This thirty-year-old store run by Sagarika Chanda has a great range of cabinets, beds and chairs. This store was started by her father-in-law who handcrafted and designed all the furniture available here. You get really interesting old school chairs at INR 30 per month! And amazing teakwood cabinets go for only INR 300. Furniture here is rented on a monthly basis. They also have really interesting dressing tables which are a very interesting blend of vintage and contemporary! N. N. Ghosh has been catering to this city’s furniture needs since way before independence! Their warehouse has some really great teakwood and mahogany furniture. Some of these pieces are almost a century old and they’ll really add that Charulata feel to your room. Their cabinets – for INR 300 onwards – are super popular. Chairs start at INR 50. The employees at Globe Furnishings will tell you about the golden days when the furniture rental market was booming. Nowadays people no longer know about these stores and after demonetisation, the market had a huge setback. They have really great stuff, cabinets start from INR 250 and mirrored ones come at INR 300. Their beds and cabinets are really popular with customers. Single beds come at INR 250 and double beds start at INR 350. Globe Furnishings guarantees that their finishing is infinitely better than the newer stuff you get at big shopping malls which lack skill and finesse. This is a great shop packed with a lot of furniture. Chairs on display are hung from the ceiling, and piled on top of each other. This definitely has more options than most of the other stores. Look out for their beautiful glass cabinets, mahogany and teak with amazing finishing. Prices begin from INR 30. Mitter & Co is over 40 years old with a great collection of old furniture pieces. They’ll proudly tell you that their furniture has featured in many films and was even rented by a production starring Amitabh Bacchan several years ago. Look around in there stash of lovely custom-made pieces, and who knows, you might find your room filled with pieces from some of the most iconic retro films! Sofa sets with center tables come at INR 650. Rafi Ahmed Kidwai Road is a five minute walk from Mirza Ghalib Street with shops filled with secondhand furniture for hire and sale. Be sure to go there with some time in hand.